Denton Brass are delighted to announce that, as of January 2019, our Training Band and main band will once again be rehearsing under the same roof! We have already run a successful training band for a number of years – in fact no less than six current Denton players started out in our own learners group. Not just a junior band (although of course youngsters are actively encouraged to, come along and have a go! 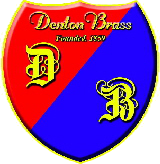 ), Denton Brass Training Band is open to everyone. Children, adults (we have members who only started playing in their fifties or sixties), total beginners and people returning to banding after an extended break – all are welcome. From the 10th of January, Training Band rehearsals will take place on Thursday evenings at 7pm, immediately before the ‘main band’ rehearsal. We are happy to report that we have retained the services of Matthew Gee as Training Band MD, and he will be working closely with Denton Brass MD Robert Yates to secure the future of the band for years to come. Denton Brass rehearsals take place at Denton West End WMC on Grosvenor Street in Denton (Greater Manchester, postcode M34 3WN). Training Band on Thursday from 7pm, main band Monday and Thursday 7:45pm to 9:45pm. Denton Brass are delighted to announce the appointment of Robert Yates as the band’s Musical Director. Robert is a graduate of the University of Salford, where he was awarded the prestigious Roy Newsome Conducting Prize. The band have been rehearsing with Robert for several weeks and have enjoyed working with him so much that we recently invited him to become our official MD. We are very pleased that he accepted the offer and are confident that he has the qualities needed to motivate and challenge the band going forward.